The Midnapore Homoeopathic Medical College & Hospital was established in the year 1945, on 3rd Dec, the auspicious birthday of Sahid Kshudiram, the first sacrificed soul of Indian Freedom Movement. 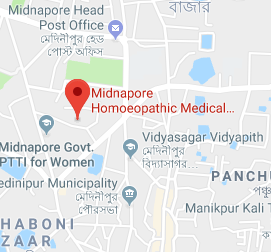 It is the 2nd oldest Homoeopathic Medical College in India, which is situated on the bank of river Kansaboti in the Marty's land Midnapore Town of Paschim Medinipur, the historic district of West Bengal. This District is hallowed by association with great heart Pandit Iswar Chandra Vidyasagar, the outstanding Scholar, Social reformer (who introduce Homoeopathy in the district as early as 1863) Rishi Raj Narayan Bose, the maternal Grandfather of Sri Aurobina, Kshudiram Bose, the selfless and fearless Martyr and a host of celebrated persons who helped to put the name of Midnapore in the Political, Social and Educational map of India. Sahid Matangini Hazra, Birendranath Sasmal, Ajoy Mukherjee are famous name of Midnapore District. Another one is Satish Samanta who brought the Homoeopathy Bill in the perliament, is also from this district. The Institution had a Drug Proving Research Unit under Central Council of research in Homoeopathy in India (CCRH) since 1957 and proved 35 drugs. Presently, the Drug Proving Research Unit is shifted from the urban district to greater Kolkata as per order of the (CCRH). The Seminar scheduled for 24th Sept, 2018 on the topic " Renal disorders and Homeopathy " by Dr Ashok Kumar Khanra, Head, Dept of Pathology has been postponed due to unavoidable circumstances. Date & time of the Seminar Will be announced later, once rescheduled. Welcome video on the occassion of Organon Seminar held on 3rd to 5th December 2011 at MHMCH. Every year on 3rd December Foundation Day of this College is celebrated. Brand new face of the MHMCH-website (www.mhmch.org) is launch today. Response and suggestion from all sectors will be highly solicited. The College, Boy's Hostel, Girl's Hostel, OPD & IPD Building all are situated in about 10 Acres of own land. The present Hospital building was inagurated by Hon'ble Mr. K. N. Katju, the then Governor of West Bengal in 1950. The Hospital is running with 50 Indoor Beds, X-rays, Pathological laboratories, well equipped Operation Theater and Outdoor Departments. The new building of the college section was inaugurated by the then Health Minister Mr. Ajit Kumar Panja on 27th January, 1977.